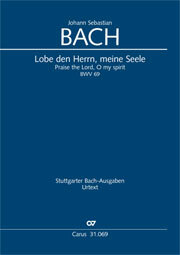 Bach’s Cantata BWV 69a of 1723, which has remained largely unknown to the present day, is now available for the first time in a practical edition with this Carus publication. It has been unjustly neglected as it was overshadowed by the Cantata BWV 69 of the same name, a piece which Bach reworked to celebrate the inauguration of Leipzig Town Council in 1748. On that occasion Bach re-used the parts from 1723 for simplicity, and adapted them for the new use by means of cuts, alterations, and additions – something which certainly did not mean that he rejected the 1723 version. This version can readily be recovered from the parts of 1723, if we explore beyond the alterations of 1748. With its rich wind instruments and great opening chorus, the 1723 cantata is in no way inferior to the later festive music in terms of musical splendor. The text takes the Gospel reading about the healing of the deaf and dumb man as a reason for praise and thanks for God’s good deeds. 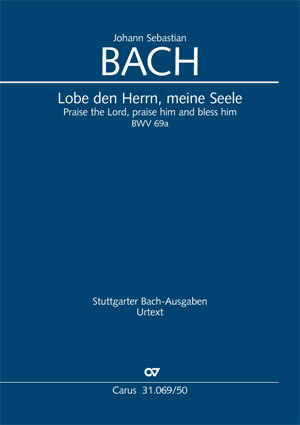 In contrast to the later version, in which God is thanked for the wisdom of the Leipzig authorities, the original version of 1723 is free of such contemporary references, and is suitable for use in worship and concerts in many different ways.